Prime Minister Imran Khan has urged Chinese businessmen to explore investment opportunities in diverse socio-economic sectors of Pakistan. He made this call during his meetings with heads of major Chinese business groups, who held separate meetings with him in Beijing. The prime minister expressed satisfaction over the progress on projects under the China-Pakistan Economic Corridor. He appreciated the business ventures of the Chinese companies in Pakistan particularly under the CPEC projects. 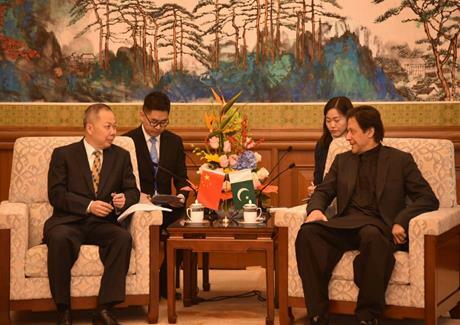 Highlighting immense market potential and geo-strategic advantage of Pakistan, Imran Khan assured maximum facilitation to the Chinese business companies for doing business in Pakistan. The heads of Chinese business groups expressed their gratitude for the support offered by Pakistan in hydropower, renewable energy, construction, infrastructure development and other sectors particularly under the CPEC projects. Later, Prime Minister Imran Khan had a meeting with Zhen Zhanmen, acting vice president Central Party School in Beijing. They discussed issues of mutual interest.